A. Lange & Sohne is a German luxury watch maker and is well known for producing super high-end timepieces, on the same scale as Audemars Piguet, Patek Philippe and Vacheron Constantin. For example, all Lange cases are made from precious metals (gold or platinum) rather than stainless steel, a metal that is widely used in luxury watches. Another unique aspect of A. Lange & Sohne is that all their movements are developed, made, and assembled in-house; something which very few watchmakers do anymore. In addition to the above, Lange became a pioneer in watchmaking technology when it developed a rare “double split chronograph” that enables the wearer to time two events for up to 30 minutes each. A recent joint venture between A. Lange & Sohne and the Paris-based jewelery store Dubail has resulted in the $1.75 Million Diamond Tourbograph Pour le Merite Watch, which is an enhancement of the limited edition “Pour le Merite” series. The obvious difference? The diamonds. These days, few may be able to appreciate such a statement of excess and luxury in watch, while others may be able to appreciate it for what it says about watchmaking. The $1.75 Million Diamond Tourbograph Pour le Merite Watch is hand-made and highly complex. It comes in an all white gold case and bracelet and features over 40 carats worth of sparking, clear white diamonds. The watch runs on a hand-assembled Caliber L903.0 movement that is manually wound, with tourbillon, split-seconds chronograph, and a power reserve indicator. There are 600 pieces in the movement. One may ask, with almost two million dollars worth of diamonds, whoever could afford such a watch? 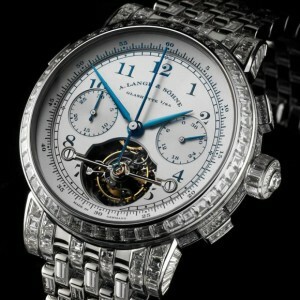 Being that the watch was commissioned by and will be sold at Dubail, perhaps there is already a buyer.